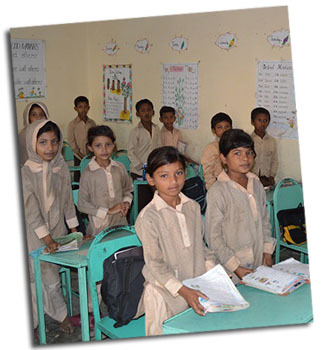 Project: To add a 10th grade to the school for Christians and Muslims in rural Pakistan, so that students can finish high school and further their education. In 2002, Paul* began a school for girls that went through the 8th grade. To continue on to higher education in Pakistan, a student must complete the 10th grade. Paul offers education to all children in his rural village, believing this will help bring peace among Christians and Muslims in a country that is 97% Muslim. Parents of poor Muslim girls are delighted to have their girls receive an education and praise Christians for offering this. Paul recently shared, “Every poor girl wishes for a chance of education, for the opportunity to learn and go to school; the girls are less privileged in our target area because they don’t have access to attend public high school at the distance; and it is not affordable for their parents because of dire poverty. We know a gift of education is the most effective way to eliminate poverty, discrimination, violence against women and save the girls from early-child marriages. The forced marriages of girls are commonly arranged by the male of their family if more than one girl is born in the family. It is considered a a curse of God and their financial burden can be reduced by binding them in early-child marriage. That’s why these ill-fated girls are deprived from a chance of education (and thus locked into a cycle of poverty). *Note: Paul is a pseudonym for our graduate living and serving in his homeland of Pakistan. For safety, please use the name Paul when sharing about his work online.